Probably the most famous street name in the country that isn’t actually a street name, the Royal Mile refers to a succession of different streets that form a thoroughfare between two of Scottish history’s most significant locations; Edinburgh Castle and the official residence of the British monarch in Scotland, Holyrood Palace. During the famous Fringe Festival in August, the Royal Mile is awash with buskers, entertainers and flyer-distributing actors and comedians desperate for you to come along to their show. On this celebrated street, the pubs are tucked away but not hard to find. 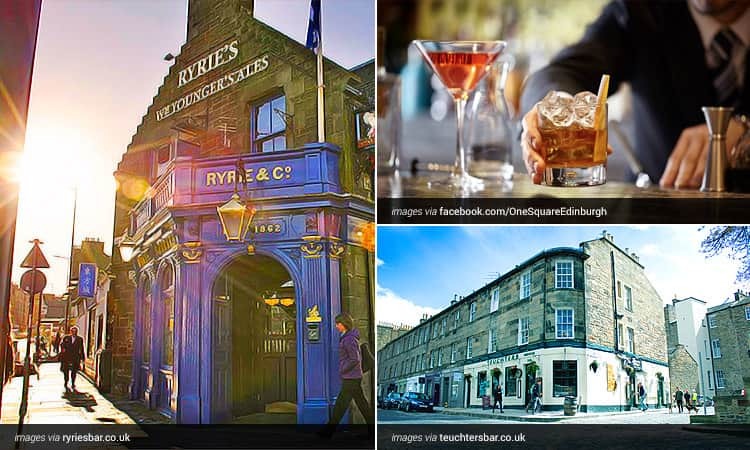 Just down the hill from the prominent, 12th century St Giles’ Cathedral, The Royal McGregor has a huge whisky menu and offers the friendly service and welcoming atmosphere that you’d expect of a family-run establishment. Ominously named, The World's End is a small, traditional cask ale pub where the walls and ceiling, adorned with foreign bank notes and flags, point to its popularity with visitors from all corners of the globe. Hundreds of years ago the city walls ended just outside the pub, meaning as far as the regulars were concerned the world really ended there. The beer lovers in your group will revel in the choice of malted barley available at The Kilderkin, located at the bottom of the hill near the Queen’s digs, and will want to settle in for a long session at The Canon's Gait, an open plan craft beer bar. Making up much of the rest of the ‘Old Town’ that isn’t encompassed in the Royal Mile, these three could easily be nightlife areas in their own right, but run into each other perfectly. They combine to provide the most varied provision of bars, clubs and restaurants in the city. Originally a marketplace for horses, cattle and other animals, the Grassmarket lies in a hollow well below nearby ground levels. The view of these low-lying terraces with Edinburgh Castle looming over them is one of the iconic views of the city and has been a favourite with photographers and artists for years. Real ale powerhouses The Last Drop and Beehive Inn are always busy, and Biddy Mulligans, affectionately known as ‘Biddy’s’, is an Irish bar where the craic flows almost as smoothly as the Guinness. As it continues east away from the castle, the Grassmarket becomes Cowgate. With its name recorded from 1428, this is one of the city’s oldest roads and is central to the part of Edinburgh that was designated as a World Heritage Site in 1995. Lying below the elevated streets of South Bridge and George IV Bridge and lined with tall buildings, Cowgate feels hidden and sheltered rather than dark and gloomy, and compact, intimate venues like Sneaky Pete’s - a live music venue and dance club - match this vibe perfectly. Set back from the street behind a vast courtyard, The Three Sisters is another popular haunt for locals and tourists alike. Cowgate’s highlight, however, is Brewdog – the second ‘craft beer oasis’ opened by the now hugely-popular Scottish brewery offers knowledgeable staff and homemade pizzas, on top of a plethora of their own craft beers and regular guest brews. 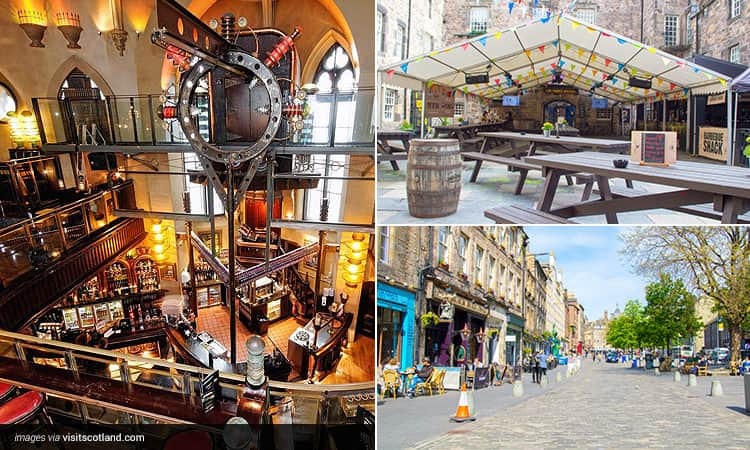 Running over Cowgate and just round a twisting, cobbled corner from Grassmarket lies George IV Bridge, where a legendary concentration of venues includes the raucous Frankenstein, a notorious themed pub with three bars set over three floors. You’ll be forgiven for thinking you’re in a theme park with the incredible artwork and props covering every wall, booth and bar. Nearby you’ll find Villager, a quirky lounge bar and Divino Enoteca, an effortlessly cool Italian wine bar and restaurant. With the Old Town representing Edinburgh’s historic capital and the New Town its economic one, the ‘West End’ can lay claim to being the city’s cultural centre. Many of the city’s arts venues are here; including the famous Royal Lyceum and Traverse theatres and the large Usher Hall concert venue. Sports culture is ingrained into Scottish heritage, and Murrayfield - the large stadium that is home to the Scottish rugby union team - is visible out past Haymarket railway station. One Square is an ultra-stylish bar within the impressive 5-star Sheraton Grand Hotel. Boasting over 70 gins, including one of their own, this is an essential visit for anyone who takes great care over what makes up the G half of their G and T. A true beer lover’s venue; the Hanging Bat ‘beer cafe’ also specialises in ribs and hot dogs, and more traditional Scottish watering holes are available, namely Ryries and Haymarket. 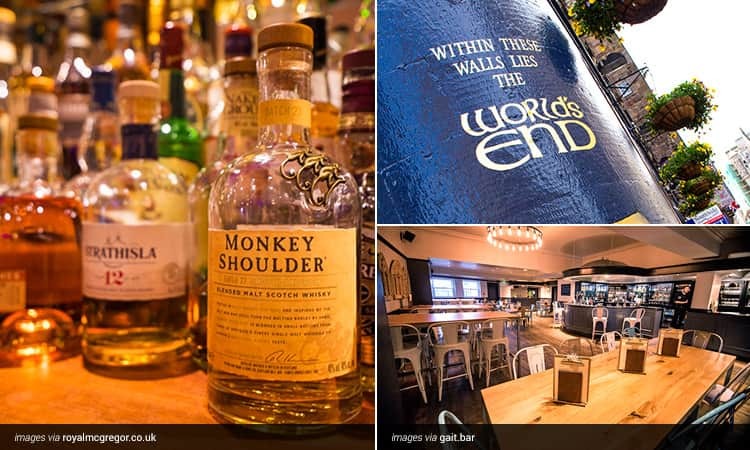 Well known to rugby fans making the pilgrimage to Murrayfield, Teuchters on William Street is a hidden gem with cosy alcoves and a massive whisky menu. As well as the Royal Yacht Britannia and panoramic views of the Firth of Forth, groups venturing out to the district of Leith in the very north-east of Edinburgh will find a modern, regenerated dockside area not dissimilar to Liverpool’s Albert Dock. This charming suburb has been revitalised in recent decades and is now filled with stylish apartments, modern bars and award-winning restaurants. 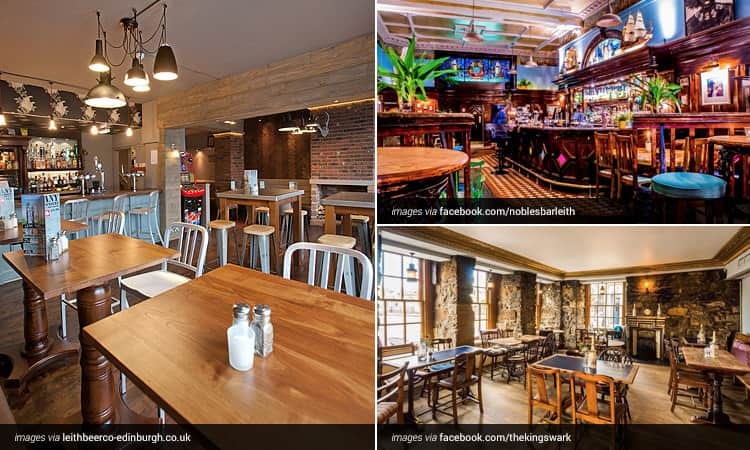 The harbour-front Leith Beer Co. offers uncomplicated pints and a popular outdoor seating area, and The King’s Wark is a low-ceilinged, dark-wooded waterfront pub that dates back to the 15th century and boasts a very high standard of traditional Scottish cooking. If you’re going to be in town in the winter months, look no further than the roaring fire of Malt and Hops, a traditional one-room free house. Nobles, on Leith’s central Constitution Street, is a Victorian cafe-bar with stained glass windows set inside a handsome old building. Probably the biggest name in Edinburgh nightlife is George Street in the heart of the New Town. 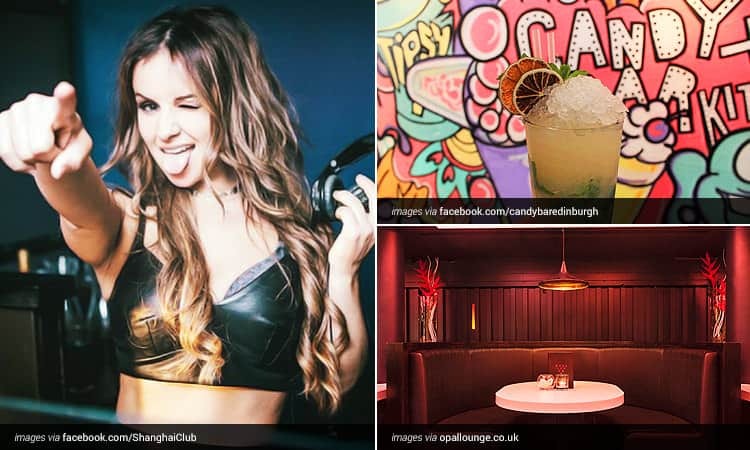 Offering a great selection of sophisticated nightlife, even if you’re visiting Edinburgh’s other areas for sessions long and short, it’s still likely you’ll end up seeing in the small hours on George Street. During the day it’s teeming with tourists and locals perusing the shops, but after dark it takes a step towards the decadent. If it's cocktails you’re after then you’ll find classics and reliable staples to get you into the swing of things at the large Slug and Lettuce before you upgrade to slightly more adventurous mixology marvels at the fantastic All Bar One and Candy Bar and Kitchen. For the long-haul, George Street boasts the swanky Shanghai, underneath the trendy boutique Le Monde Hotel, and Opal Lounge, both of which are open until 3am and are favoured haunts of the in-town celebrities. 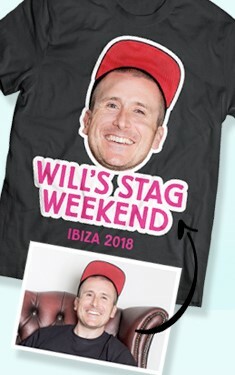 ‘Auld Reekie’, as it’s affectionately known, is a fantastic option to host a stag weekend and not just for its notorious nightlife. 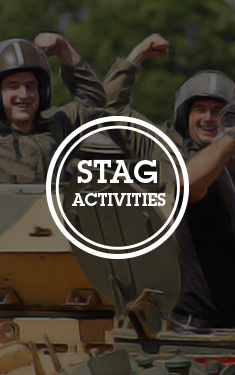 If you fancy checking out some of our recommendations and our large portfolio of accommodation and activities, then head over to our Edinburgh stag weekends page and place an enquiry now.